December 2017 Jimmy Moffatt is in no rush to finalise future plans for Highland Lodge following his fine effort in defeat in the Becher Chase at Aintree on December 9. Winner of the race in 2015 and beaten just a short- head by Vieux Lion Rouge in last year's renewal, the 11-year-old ran another commendable race to finish third behind hot favourite Blaklion and 2016 Grand National runner-up The Last Samuri. Highland Lodge, who has run just five times for Moffatt, was pulled up in last season's Grand National and his trainer will discuss with his owners whether to aim for the world's most famous steeplechase again or head elsewhere. "He's absolutely A1 and I just feel very privileged to be associated with a horse like him," said the Cartmel-based trainer. "I'm immensely proud of the horse. We had a great day two years ago and last year was tough to take, but I can't be anything but proud of him after his run on Saturday. "He doesn't take much racing, so for him to go and run like that on his first run in a while was great. "He's run into a very well-handicapped horse in Blaklion and he'd had a few battles for the lead before he came with his challenge. We'd seen them all off and only cried enough when Blaklion came. "If Blaklion hadn't been in the race, I think we might have beaten The Last Samuri." Asked about future targets, Moffatt added: " The director from Cheveley Park Stud is coming up next week so we'll have a long chat and come up with a plan. "Whether we aim at the National again or the Topham, or Henry (Brooke, jockey) even mentioned the cross-country race at the Cheltenham Festival. "We might even run him in late January or early February, but we'll have a chat about it next week and go from there." *Bought by Patricia Thompson on March 31, only three days after she acquired another 2017 Randox Health Grand National intended runner Le Mercurey. Thompson purchased Party Politics on the eve of his Grand National success in 1992 and also tried to win the race again with other last-minute purchases, Character Building (7th in 2010) and Mumbles Head (refused 30th in 2013). *Highland Lodge has purposefully had only one appearance so far this season, going down by a short-head to fellow Randox Health Grand National contender Vieux Lion Rouge in G3 Betfred Becher Chase over the Grand National fences on December 3. His target has always been the 2017 Randox Health Grand National and he runs well when fresh. *Captured the same three and a quarter mile handicap chase at Aintree in 2015, staying on well to beat Dare To Endeavour by two and a quarter lengths; also finished eighth in 2014 renewal. *Narrowly missed out on running in last year’s Grand National, having been 47th in the final list. *Purchased at Doncaster Sales by previous connections as a potential Grand National contender for £22,000 in November, 2015, having previously been trained by Emma Lavelle. *Has never fallen or unseated his rider, but been pulled up twice. David and Patricia Thompson are best known as owners of Cheveley Park Stud just outside Newmarket. Although famed for their Flat racing exploits, the Thompsons have won Jump racing’s most famous prize before, having bought the 1992 Grand National hero Party Politics on the eve of his victory. Party Politics, who spent his 13-year retirement at Cheveley Park Stud, lived to the ripe old age of 25. Mrs Thompson said in July, 2009, when he died: “We will always remember the excitement of Grand National day in 1992 – and indeed his very creditable second in 1995 – as one of the major experiences of our racing ownership.” David Thompson, 81 (born April 4, 1936), is a former Smithfield meat trader who first made his business mark with the Hillsdown Holdings food group, which he later sold in two separate deals for about £300 million. In the 2016 Sunday Times Rich List, David and Patricia were valued at £710m. The Thompsons, initially in partnership, bought the rundown Cheveley Park Stud, where horses have been bred for more than 1,000 years, in 1975. Music Boy, whom they raced, became their first stallion. It has become the most successful British-owned breeding operation in the country. Now stretching to around 970 acres and managed by Chris Richardson, its umbrella also covers the Sandwich, Warren Hill and Ashley Heath studs. It both sells and races the horses it produces and Russian Rhythm, a sales purchase, brought Classic glory when winning the 2003 1000 Guineas, going on to land both the Coronation Stakes and Nassau Stakes. The stud operation currently can house around 120 broodmares and stands eight stallions including leading sire Pivotal. St James’s Palace Stakes winner Excellent Art and 1997 2,000 Guineas hero Entrepreneur were bred and sold by Cheveley Park, while some of the Group One stars to race on the Flat in its patriotic red, white and blue silks include Red Bloom, Confidential Lady, Regal Rose, Echelon, Nannina, Exclusive, Peeress, Pivotal, Virtual, Chorist, Integral and last year’s Breeders’ Cup heroine Queen’s Trust. Its Flat trainers for 2017 and the 90-plus horses in training are headed by Sir Michael Stoute, a director of the stud, and include Robert Cowell, Clive Cox, Richard Fahey, James Fanshawe, John Gosden, William Haggas, Richard Hannon, Sir Mark Prescott and Roger Varian. Patricia Thompson has bought Highland Lodge from Bowes Lodge Stables.Simon, 49,and his wife Julie Wilson have horses in training with Jimmy Moffatt and Ireland’s champion Jump handler Willie Mullins under the Bowes Lodge Stables banner, which takes its name from a property that the pair used to own. The couple, who live in the village of Houghton Green near Warrington, started out in syndicates before setting up with their own horses in 2009. Both Simon and Julie are season ticket holders at Liverpool FC and the Bowes Lodge Stables colours of red, white and yellow are based on the club’s colours – the stars on the cap represent Liverpool’s five European Cup/Champions League victories. The Wilson’s 24-year-old son Rhyan is also involved in the partnership. Their other son, footballing-mad Patric, died at the age of 16 in February, 2016, just months after leading Highland Lodge into the winner’s enclosure following the Becher Chase victory at Aintree in December, 2015. He had bravely fought cancer after a brain tumour had been discovered after he just turned 15. A former jump jockey, James (Jimmy) Moffatt, born June 14, 1972, enjoyed success as a northern-based rider, employed mainly by his father, Dudley Moffatt, who is still involved in the family training business. His notable successes among his 78 wins as a jockey included three on the talented Morceli, as well as major wins for his father on Home Counties in the 1995 Vincent O’Brien County Handicap Hurdle at the Cheltenham Festival and in the same year’s Scottish Champion Hurdle, and Deb’s Ball in the 1993 West Yorkshire Hurdle. He quit riding in 2003 to take over the licence at the family’s picturesque small stables, which his father built in 1985, at Cartmel in the Lake District. His best horse by some distance has been Chief Dan George, winner of what is now the G3 Ultima Handicap Chase at the 2010 Cheltenham Festival, as well as G2 River Don Novices’ Hurdle at Wetherby, the G2 Prestige Novices’ Hurdle at Haydock and the G1 Sefton Novices’ Hurdle during the Grand National Festival at Aintree. Moffatt’s brother, Darren Moffatt, is a former Flat jockey. Jimmy is enjoying his joint-best season as a trainer with 11 winners (up to March 29). He married his long-time partner Nadine in 2015. Born Tadcaster, October 31, 1990 Background: Brooke was raised at Easingwold, Yorkshire. His mother Julia, who show jumped and then rode in point-to-points under her maiden name of Platts, ran a pre-training yard, which also housed a veterinary clinic, and training point-pointers before taking out a training licence n 2015. Henry’s brother, Danny, rode in pony races and is a trainee livestock auctioneer and sheep breeder/dealer. Henry’s first ride in a race – in a point-to-point – came on Pikachu Blue, a horse that was gifted to him as a birthday present by trainer Sue Bramall. He finished third on that debut, but it took him another two seasons before he broke his duck in points. He flirted with Flat racing and had 14 rides on the level in 2010 and 2011. He became a conditional jockey and now rides as a freelance, having spent four years with Cheshire-based Donald McCain. 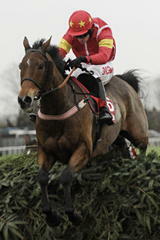 Brooke won the conditional jockeys’ championship with 41 winners in 2011/12. In December, 2015, Brooke rode Highland Lodge to win the Betfred Becher Handicap Chase over the Grand National fences for trainer James Moffatt. He made a miraculous recovery from serious injury sustained in a fall at Hexham in October, 2016, when he was airlifted to hospital after being placed in an induced coma, having a collapsed lung, nine fractured ribs and fractured shoulder blade. Brooke returned to race-riding in the space of seven weeks and was able to partner Highland Lodge to finish a close second in this season’s Betfred Becher Handicap Chase. He is enjoying his best ever season with 45 winners (up to March 29).